04/09/2016 MEC #2 Road Race Time 21:54. Place 11/269 OA, 1/13 AG. During the Fall of 2010 a couple buddies and I were sitting around the fire having a beer when someone brought up the conversation about doing a triathlon. By the end of the conversation the three of us committed to doing a triathlon the following summer, or at least I thought. With that being said it was game on from that point. I went out a couple weeks later and bought a new Tri bike and started swimming and running once a week. I could barely swim 25m without stopping to catch my breathe. I thought this was ridiculous since I swam competitively when I was a kid. Then I realized that was almost 35 years ago at that point. I felt like everything was falling in place and I had this. I was training every week or two and I was going to crush these guys at the race. January came around and I sent out an email to my two buddies to see how training was going and if they had signed up for the race yet. Funny thing was that both of them responded with almost the same comment. "I thought we were just joking about this". Well after a couple of weeks of convincing they both signed up for the race and I was feeling good about this as I have had months of training ahead of them. During the summer we did some rides and runs together. One buddy was an uber biker and the other was a good runner. I was able to stay ahead on the runs though. With that being said I still felt good that I have put more time in the pool then both of them and I could out run them. Closer to the race we started adding some swims together at the lake and it gave me an opportunity to break in my new wetsuit. During the lake swims I would still come out front which continued to boost my confidence that I was going to destroy these two buddies during game day. The night before the race I turned in early and made sure I hydrated well the day prior to the race with water. My buddies did the same but instead of water they had beer and wine. I knew this wouldn't go well for them. Race morning we arrived and set up in transition, then suited up to warm up for the swim prior to the start. When I looked out to see where the turn around buoy was I couldn't believe how far it was for an Olympic swim. Looked like it was a mile away rather than just 750m. 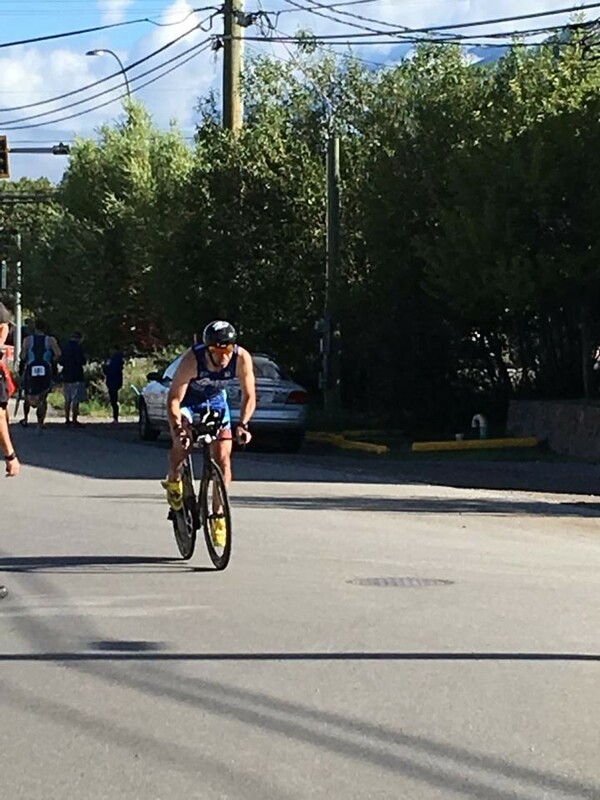 I knew for sure my buddies would struggle with this distance and was hoping to get a good lead on them coming out of the water so the uber biker wouldn't have too much time on me coming out of T2. Well the gun goes off and the three of us start out together. I start pulling away and at about the 200m mark I am done. I can barely move my arms. My arms were so tired that I had to start doing the breast stroke and then would start to swim again for a little bit. This went on for the entire swim. From this I learnt how to put on a wetsuit properly. After coming into T1 and seeing both of my buddies bikes already gone this changed the game plan. I wasn't to worried as I knew I could out run them so I just had to make sure they didn't get to far ahead. Coming out of T1 there is a large hill that you ascend up. I stood up to help power up the hill. I was about half way up when I had a massive cramp in my quad and seconds later my other quad cramped up. I struggled to unclip but was able to get my foot out before falling over. Needless to say I feel to the right with car traffic to the left. This is where I had a major internal struggle. I just started the race and I'm already in major pain and my truck is only a couple hundred metres away, but on the other hand I have put all this training in to give up so early. But if I quit then my buddies didn't really beat me. Then I said F&%k it, I didn't come this far to pack it in, jumped back on my bike and started riding again. Legs didn't feel to bad after the pit stop and I was able to complete the ride into T2. Starting the run again there is another steep incline we hit and then it drops into a sharp decline. I was doing fine until I got to the bottom of the decline and both quads cramped again. At this point I knew my race was over but was pleasantly surprised at the people that were passing me while I walked, asking if I was ok and offered nutrition. I declined but was not expecting that. Shortly after that while walking past some of the homes a gentleman standing in his yard cheering athletes on asked if I needed anything. I once again declined and used his fence to stretch out on. He said don't go anywhere and I will be right back. He quickly came back with some orange juice and fruit to help with the cramping. I was speechless that a complete stranger would do this. I thanked him very much for his generosity and continued on. I tried running again and could feel that the cramping in my quads were not far from appearing again so my running was more of a speed walk until I once again said F%@k it and ran through the cramps in my quads. Needless to say I couldn't move or walk for the next 3-4 days after that decision. At the end of the run we came down the same hill that we initially ran up. While coming down this hill knowing I was close to the finish line I started to become emotional that I was able to complete this as well as the people that I came into contact with while suffering out there. I finished the race in 3:27. Yes both of my buddies that I out trained completed before me. Even with that being said I still became hooked on triathlon from that moment on. 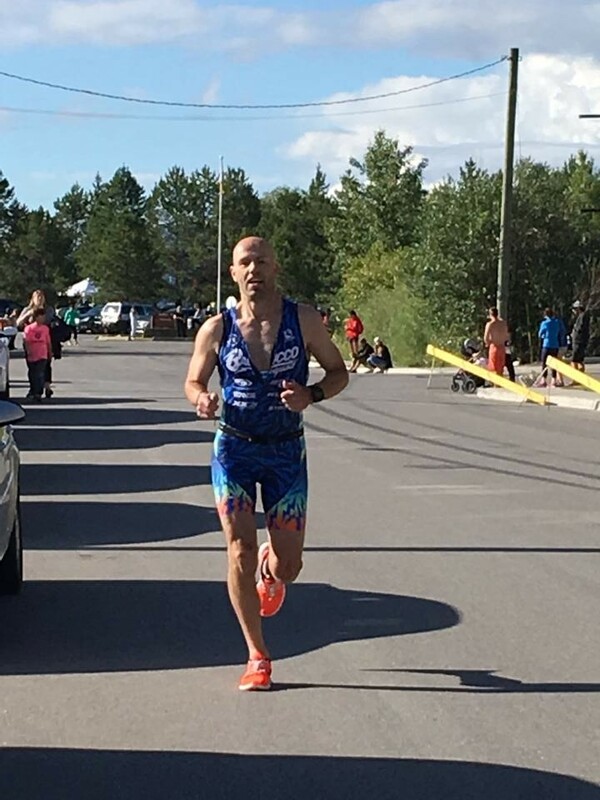 Two years later I joined a Triathlon Club and had a PR of 2:40 at Oly distance but then dropped down to Sprint races to work on my speed as I was still struggling with cramping in my quads. Since then I have won several AG races and participated in 2 World Sprint Championships with a PR of 1:12 and still looking for a perfect race. 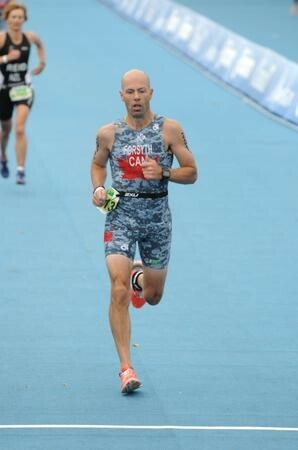 Im hoping to find a little more speed this year with plans to finally move up to a 70.3 distance. The swim is how far?